Address: 75 Saint Marks Pl. The booths are jet-black and the wood paneling only a few shades lighter (if it were a crayon, it might be called "Coffin Brown"). 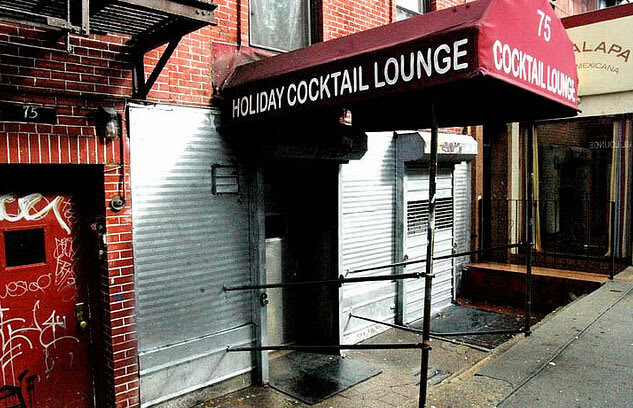 Holiday Cocktail Lounge is a relic, a sooty spot of time trapped in a dark bar where you lose track of time, your sobriety, even the status of your life. You've become unstuck in time, Billy Pilgrim. You aren't on St. Marks anymore—all the kids buying glass pipes have vanished. There's only your $4 whiskey and the senile guy at the end of the bar who wants to talk to you about something but he keeps forgetting what. So you move to one of the cracked booths. And then, when you wake up, the world has ended. But this bar is still here.